Home organization guru Rachel Hoffman is just like you and me — the last thing she wants to do when she gets home from work is clean her house. But Hoffman, whose blog Unf*ck Your Habitat sparked a cleaning frenzy online, has developed methods to cope with mess in small increments. Rather than doing everything all at once, she makes incremental and sustainable changes to her habitat. The best part about Hoffmann: She understands that you lead a super busy life and probably don't have money to hire a housekeeper. She gets that you have a tendency to be messy, and even lazy. So she's created manageable tips and tricks for keeping your house clean, which in turn leads to better mental and physical health. She’s been called the anti-Marie Kondo, the Japanese home economics expert who launched a movement of cleaning out focused on only keeping things that give you joy. Hoffman’s approach is much more down-to-earth: “Don’t put it down, put it away.” Her “20/10” method, which allows 20 minutes of cleaning up with a 10-minute break, minimizes how much time you spend cleaning and maximizes an organized living space. 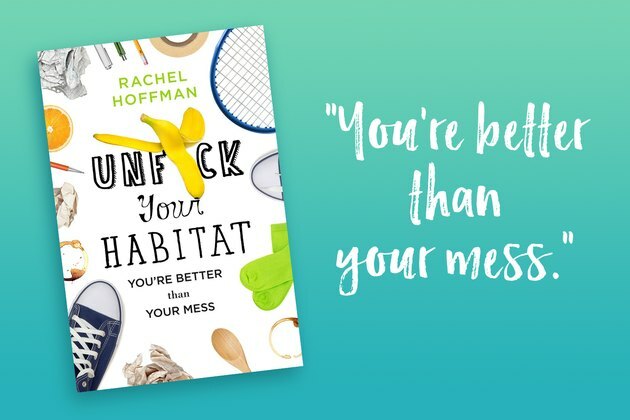 Check out this week’s podcast above and learn more about Hoffman’s secrets to a clean home as well as how unf*cking your habitat can improve your wellbeing. Do you clean your house on a regular basis? Do you judge people on how clean their houses are? What methods have you tried to keep your home organized? Tell us your tricks and tips in the comments!